Tree cabling is needed to help reduce the risk of tree failure and should be added to certain trees. This type of support system should only be installed by a skilled professional because if the cables are not placed properly or are placed in improper areas, they can actually weaken the tree. Support cables are placed at certain areas on the tree to limit the lateral movement of limbs. Poorly structured and multi-stemmed trees as well as certain species of trees are more susceptible to breakage that can affect the health of the tree. Too, they can be potentially dangerous depending on their location and proximity to your home and other structures on your property. During periods of high wind, snow, or ice, these trees can break and fall. We can help to save limbs and trees by providing much needed support to the overall tree structure. Before we install cables and mechanical help to a tree, it should be properly pruned. We do this because it is important to remove hazardous and dead limbs that could be inhibiting the tree from growing in a productive pattern. The tree must be solid and large enough to support the mechanical structure and cables. 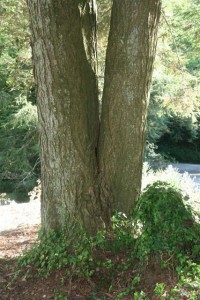 Often multiple cables are installed to maximize the strength of the tree. Tree cables should be inspected annually. All cabling systems should be updated or replaced as needed, especially after seven to ten years of wear and tear as the tree grows. Some trees may be too severely damaged to have cable installed. In these rare cases, we can advise you on the best method of handling the tree. At Hunter’s Tree Service, Inc., we provide pruning, view enhancement, tree removal, stump grinding, bucket truck service, crane service, lightning protection, pre-construction consultation, and fertilization and pest control in addition to tree cabling in Banner Elk, Linville, Boone, Blowing Rock, Newland, and Valle Crucis and neighboring communities. We service both residential and commercial customers. © 2012-2019 Hunter's Tree Service, Inc.